Not too long ago, product designer Joel Johnson and his "mechanical systems genius, inventor" brother, Justin, were brainstorming ideas for a new business when they thought they came up with a winner: a workspace with equipment for start-up manufacturers. "I was telling my friend about it and his response was, 'That's not very original!' We didn't know about makerspaces. I did an Internet search and found TechShop." As he discovered, TechShop has been there...and has successfully done that. Makerspaces are DIY spaces shared by people inventing, creating products, and learning how to use the manufacturing tools to make them. In other words, as TechShop CEO Mark Hatch explains, "Makerspaces are Kinkos for geeks!" Instead of copying documents and sending faxes, users are making products with mills and 3D printers. As a result, they're creating businesses that boost the local labor force and put money into state coffers. "As far as we can tell," Hatch said, "our three locations in the Bay Area alone have created $12 billion in share-holder value and 2,000 high-paying jobs and California is already making $20 million a year just on the income taxes on those jobs," which Hatch said are generating $100-thousand-dollar-plus salaries. 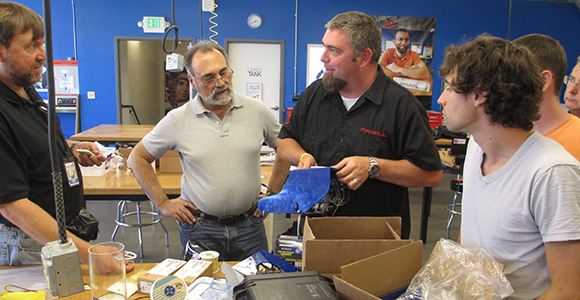 TechShop runs a growing network of open access manufacturing workshops across the country. In return for a monthly or yearly fee, members can drop in and use its state-of-the-art equipment, and business partners are scrambling to come aboard. A consortium of universities funded TechShop in St. Louis. The Ford Motor Company co-funded one in Detroit and Lowe's Home Improvement funded one in Austin. According to Hatch, the first of five TechShops planned for Los Angeles is scheduled to open its doors next year, with the cost split between the developer and the city. "These things are expensive," Hatch says. "It costs $3-million just to open the doors, but we're presenting them to universities, major corporations and government entities as an innovation engine, a STEAM (science, technology, engineering, art and math) innovation platform and a job center." While TechShop has helped launch countless businesses, one of its most impressive success stories is literally a rags-to-riches tale. "Marc Roth was homeless and living in a San Francisco shelter when two guys came in and tossed one of our brochures in a trash can," Hutch explained. "Marc fished it out...came in...spent his last $50 on a laser-cutter class and ended up re-booting his entire life." Hutch said Roth went from making tchotchkes and selling them on the street, to starting his own laser-cutting business and helping other homeless entrepreneurs launch their own ideas. As for the Johnson brothers, they decided to continue their brainstorming sessions in a TechShop workspace and came up with a product forged by ingenuity with a big dose of irony. It's called BoXZY (pronounced "Boxy") and it's basically TechShop in a box. "We thought, wouldn't it be great if small businesses could start their own modular manufacturing facilities and build according to [their market] demand?" said Joel. "So, we started looking around TechShop to see what tools people were using the most." The answer turned out to be a manufacturer's essential trifecta; the laser cutter, the computer numeric control (CNC) milling machine and the 3D printer. BoXZY is a 3-in-1 machine with the approximate footprint of an early model PC. The fact that its 3D printer alone is precise enough to make chainmail for a temperamental Templar knight perfectly illustrates one of the brothers' main goals: to dissolve the distinction between commercial and consumer tools. In short order, 630 backers pledged nearly $1.2 million to Kickstart BoXZY to life. Primary manufacturing is currently underway, but beta versions are already producing success stories. A videographer/artist is using BoXZY to create iPhone cases made of wood, and some of his models are already sold out online. And, like TechShop, the BoXZY brothers want to put much of their focus on schools and universities as a way of fueling both the passion and the promise of starting a new business. "When you're doing work [with BoXZY] you're working with mathematical concepts and developing spatial skills. You're building tangible things that you value, not just something you've created on a [computer] screen." To further boost California's workforce and economy, Hutch believes cities and states need to reallocate some of the spending on workforce development to include the development of makerspaces. After all, he said, "makerspaces are rapidly becoming critical pieces of a jobs, innovation, and education infrastructure." By the way, more than 7,600 miles away from the Bay Area, a school in Pakistan I looking into securing 10 BoXZYs for its students. In California, the makerspaces community hopes policymakers are taking notes.